Cisco says partners lacking deep knowledge of Kubernetes can rapidly deploy a production-worthy system with confidence. Containers are starting to displace VMs as the preferred platform for many enterprise application deployments, particularly for inherently decoupled workloads that can use the horizontal scaling provided by cluster management systems like Kubernetes. Unfortunately, like software from other complex open-source systems, cluster managers are tricky to install, configure and optimize, which explains the success of commercial packages like the Docker Enterprise Edition, Platform9, Rancher and vSphere Integrated Containers. For production deployments, most organizations don’t have the time, expertise nor inclination to port, integrate and debug open-source software. Furthermore, those same IT shops want to build container clusters out of existing systems, posing another set of integration challenges, which explains the value of commercialized, bundled, vendor-supported open-source products. 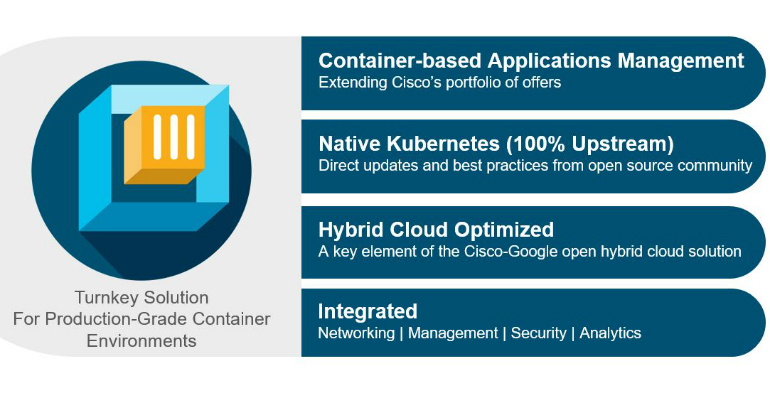 When Cisco announced a partnership with Google last fall, it seized an opportunity to make its hardware a first-class container host by integrating and optimizing commodity open-source software for its products. Indeed, as Cisco CEO Chuck Robbins noted at the time, the company understands that organizations want to build hybrid-cloud infrastructure, and that by working with Google, the pair can provide the best of both worlds. Software optimized with Cisco HyperFlex 3.0, available in April 2018. Software supported on VM infrastructure, bare metal, public cloud — available in summer 2018. Cisco says that pricing will be by subscription, based on the number of cluster nodes deployed, with volume-based discounts. The product is more than just an open-source packaging exercise, since Cisco also incorporates its in-depth networking know-how and product line by including the Contiv virtual fabric for containers, VMs and bare-metal systems. Kubernetes deployments often use Open vSwitch with Open Virtual Network (OVN) to create overlay networks for containers that span hosts in a cluster. These can make already complicated data-center networks, which might already have VXLAN overlays for VMs, even more challenging to operate. Contiv addresses the problem by simplifying the interconnection of virtual container networks with physical and VM networks. The Cisco Container Platform also integrates the Contiv fabric with Cisco’s ACI (Application Centric Infrastructure) automation software for network management and security policy enforcement. As expected of a commercial product, the Cisco Container Platform has a UI for cluster management and self-service deployment. Management features include user authentication and authorization with role-based policies for access and resource usage using the Istio technology Google previously introduced to secure, manage and monitor microservices. Being based on the open-source Kubernetes code means that Cisco’s product is compatible with existing container workloads, DevOps tools and plug-ins. Cisco partners using HyperFlex for VM workloads and wanting a packaged solution for container workloads should look no farther since the Cisco product is ready to run and is supported. The Google Cloud linkage is a potential sticking point for partners that already have incorporated AWS or Azure into their service mix since the Cisco-Google agreement will undoubtedly lead to future products and services that seamlessly tie on-premises Cisco clusters into Google Container Engine (GKE). Indeed, the head of Google Cloud Technology partners stated that the company intends to combine on-premises and Google Cloud services into a shared service catalog using GCP API and service-management products. While a compelling hybrid-cloud vision, it imposes another vendor on partners that have already taken sides in the public-cloud battle. Nevertheless, like the Pivotal-VMware-Google partnership for PKE, it shows Google Cloud aggressively trying to win enterprise container business, meaning that partners building a container portfolio should give it serious consideration as the public half of hybrid container designs.